A farrier, also referred to as a blacksmith, is a person trained to trim horses’ feet and apply shoes when necessary. Some horses that are used for riding, especially at faster gaits or on hard or rocky terrain, will benefit from having shoes on at least the front feet and possibly all four feet. In some cases, horses that are not used for riding may still require shoes to keep them comfortable. Your veterinarian and farrier or trimmer can help you decide what will fit your horse’s needs. The interval that your farrier will need to trim and/or re-shoe your horse may vary slightly with the environment, the season, and the horse’s hoof quality, but generally every 6 to 8 weeks is recommended. If this interval becomes much longer, the hooves can wear down or chip and crack unevenly causing pain, lameness, abscesses (very painful infections within the hoof), and strain on the tendons and ligaments further up the leg. Some of these problems may take a prolonged period of time to correct or may even have permanent effects. During the interval between farrier visits, the owner also has responsibilities in maintaining good hoof health. 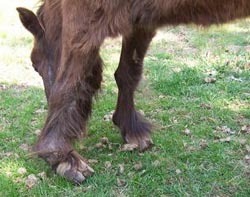 The hooves should be picked out the daily to remove mud and feces and to examine the underside of the foot. Dirty, wet conditions can lead to infections such as thrush, a common bacterial infection that destroys the frog (the soft, central portion of the hoof) and can lead to lameness. Rocks should be removed as they can lead to bruising of the foot. If a nail is present, however, a veterinarian should be called before removing it. If your horse loses a shoe, an appointment with your farrier should be made soon to have it replaced. Until this appointment, a protective boot or bandage may be necessary or your horse may need to be kept in a stall to prevent bruising and further damage to the hoof. It is thought that Maggie's hooves had not been trimmed in 15 - 20 years. Most of her life. Factor in a history of chronic laminitis and you have one uncomfortable mare. Maggie arrived at Traveller's Rest Equine Elders Sanctuary, in this condition, in March 2004. Her legs will never be straight, never be normal, but she is becoming much more comfortable. Maggie's hooves are trimmed every five weeks, each time taking only small amounts of extra growth away, to allow her ligaments and muscles to gradually adapt to new configurations. We know we are in for a long haul with Maggie, but seeing her amble around her small paddock at will, rather than seeing her frequently laying down, assures us that she is up to the task of rehabilitation. Maggie may never be completely sound. Maggie may never be "normal." But for the first time in possibly 15 years or more, Maggie is comfortable. Maggie is home. NOTE: Material presented by Traveller's Rest Equine Elders Sanctuary on equineelders.org or in any other manner is for information purposes only. It is in no way intended to replace the services or advice of your veterinarian.